Here's another of the photos that Hollie took the other day. One that won't make my mommy blush. We decided that when you are pregnant, it is important to gaze down and think nice thoughts about your baby. My mom called yesterday to let me know that in the 70's when she was having her babies, women didn't show their bellies in maternity photos. They also wore tents instead of t-shirts. In the 90's though, those same women got tattoos in precarious places to embarrass their daughters. I LOVE this picture of you! I will be checking your posts everyday to see when that little(big) boy is coming. I am praying that you will get to go through labor and the ring of fire just as you imagined. Love you! Oh it's your mom w/ the Tat..... I thought maybe it was Claire! Though she wasn't born in the 90's LOL! Say do you have one too Kar? I'm game to get one..... maybe we put a group together as a sort of mom bonding experience! I think I like the other picture better. I'm neutral on the naked belly issue, but love your smile in the first one! It's like the opposite of raised eyebrows. Also, love the sweater. You're a funny gal! 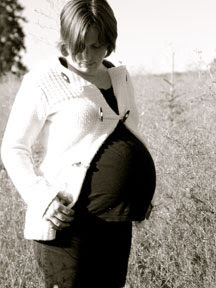 I love the prego pics. They are beautiful...and so are you!